Bounded by four major urban streets and with multiple vehicular access points, including a below-grade loading dock, the 1.4-million-square-foot Washington State Convention Center Addition project requires substantial civil engineering expertise. 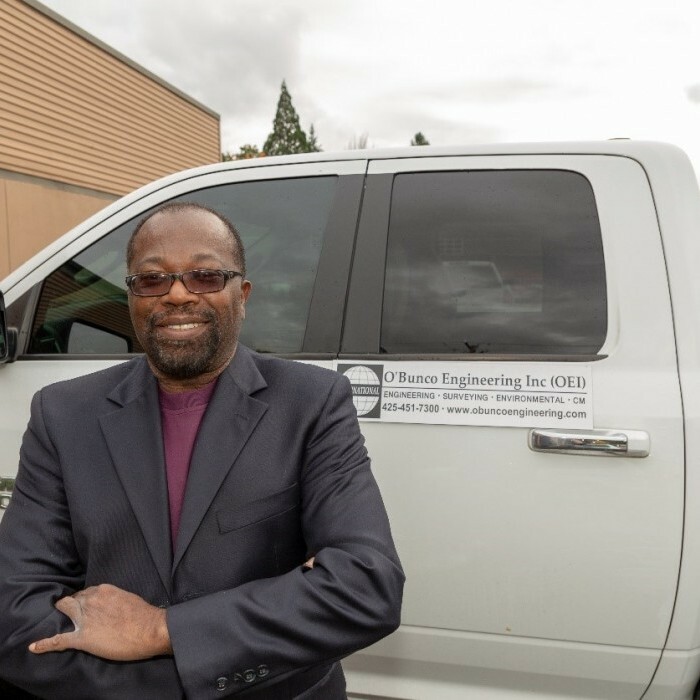 Samuel Obunike, founder of O’Bunco Engineering International Inc., a full-service, multi-discipline civil engineering firm located in Kent, WA, is up to the challenge. The team at O’Bunco Engineering is no stranger to working on big projects in the region. “We solve complex engineering problems,” said Samuel of his firm. Other O’Bunco jobs in the region include updates to the Sea-Tac International Arrivals Facility, the Veterans Affairs Puget Sound Healthcare System Mental Health & Research Facility, and Mercer Corridor and Denny Way improvements. Samuel understands just how needed the Addition project is in the community. Citing the Convention Center’s current capacity limitations, he believes the new Summit building will help the economy as more convention-goers spend their money around the region while in town. The Addition project will have a direct impact on O’Bunco Engineering as well, providing work for its employees. A minority business owner, Samuel is proud to see the fruits of his firm’s labor when a project is complete, knowing that the work helped the client and also supported his staff and their families. “It gives me joy when a job is completed, and when you can actually drive there and see the final product of that job,” says Samuel.